How to create ipa in xcode 6 without Apple Developer account? Is there any way of creating .ipa without developer account credentials? Finally found a way for creating .ipa build with xcodebuild command. Right click on Archive on Organizer. You can see .xcarchive file in Finder. Open Terminal and cd to .xcarchive path. Using following command to generate .ipa file. This will save .ipa on Desktop. There are 3 WAYS to create .ipa WITHOUT Command & Apple Developer Account. Now, create directory and name it as Payload, copy .app into Payload directory. Now right click on your app under Apps tab of iTunes and select Show in Finder, this is your .ipa file !!! Create Archive using any Xcode version. 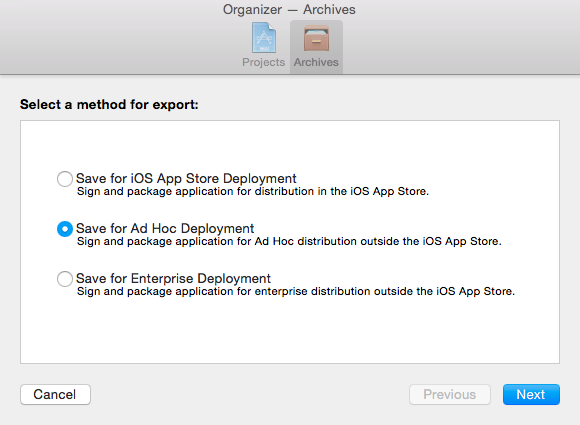 Go to Organizer window of Xcode 5.x and from Archive tab select your archive. Go to Products folder & it will show app file right click "Show In Finder". Create an empty folder & call it 'Payload' then copy your app file in that folder. There is even better way without doing all the command line stuff. 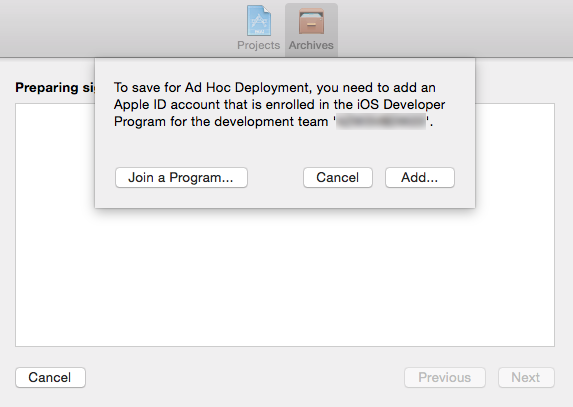 Select "Save For Ad Hoc Deployment" & Click Next. Then open the "select a development team" drop down. It will have the option "Use Local singing assets" at the bottom. Select this option & Click Choose. Here you go. The build will be created by Xcode without Apple ID Account. Another solution is to use Xcode 5.1. Not the answer you're looking for? Browse other questions tagged ios xcode6 ipa ad-hoc-distribution apple-id or ask your own question.